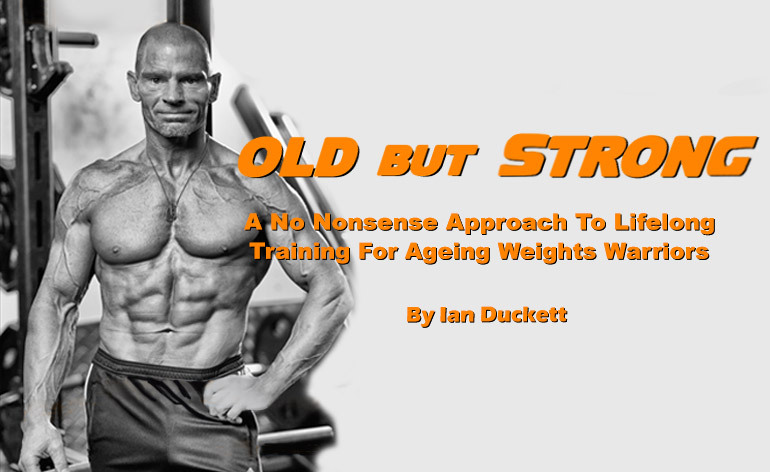 Synopsis: With 36 years’ of training experience and a long list of natural bodybuilding competitions behind him, Ian Duckett shares his knowledge of how to continue to make gains as you gradually age. Review: All you need to do is take a look at the cover of this book and you will see that it has been written by a man who is passionate about building muscle. Well-developed abs and vascular arms stand out on the author`s ultra-lean physique. Ian Duckett opens the book with a positive outlook of ageing. In the introduction, he uses an example of Sylvester Stallone at age 60 successfully playing boxer Rocky Balboa, showing us that age shouldn’t be a massive barrier in accomplishing goals . In Ian`s own words “I am not negative about age, at all.” He informs us that getting bigger and stronger is certainly possible as you get older and he`s straight to the point in telling us that you will have to make plenty of modifications in your training and nutrition as your body`s recovery ability inevitably slows down. Warming up is regularly emphasised throughout the book and Ian jokes that it now takes him an hour to warm up! Knee and elbow sleeves, foam rolling, Deep Heat and ice are excellent suggestions by Ian for injury prevention and aiding recovery as well. The training programs in the middle section of “Old But Strong” are very informative. Routines for bodybuilding and powerlifting are presented. The veteran lifter still works hard on basic lifts such as squats, bench presses, chins and dips. I thoroughly enjoyed Chapter 7, a whole chapter dedicated to squats and hard leg training! Some of the chapters in the book give us opportunities to look into Ian`s past training and personal life. He had the ambition of opening a gym at 25, winning the British title and writing a bodybuilding book. His strong work ethic (e.g. working three jobs daily) helped earn him this success. The book also contains several past photos of Ian`s physique and some fantastic photos of him looking incredible at age 50. Plenty of references are made to legendary bodybuilders of the past, which will appeal to older bodybuilders and strength athletes. For example, Vince Gironda and Bill Pearl influenced Ian`s nutrition choices. Robby Robinson had a big impact on Ian and taught him the value of good form in repetitions. Summary: This book is nicely structured, easy to read and full of useful training and nutritional advice. As someone who is also a lifetime natural lifter, I will listen to Ian`s advice and learn from his experiences. He promises that after reading this book you will embrace ageing and he succeeds in doing that. I highly recommend this top-notch book for anyone over 40 who trains. If you’d like to find out more about Ian or to order his book, feel free to visit his engaging, no-nonsense website and Facebook page.